While I am sure most of you are not familiar with this crazy character, I suspect a lot of you use the tools that he represents. You see, this is Dr. Scripto. I am not sure which delusional drunk came up with the idea and design of the character, but I think it is a fair bet that Stan Lee was not in the room. 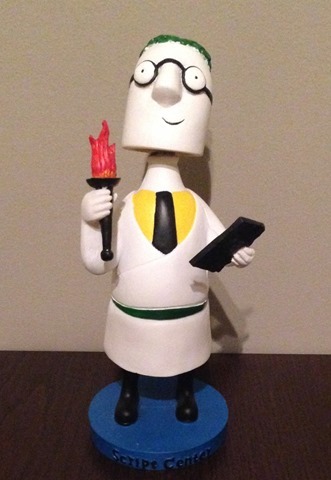 You see, Dr. Scripto is the mascot… the hero if you will, for PowerShell. Yes, I am serious, and no, I had nothing to do with the cockamamie idea that a scripting environment needed a mascot or hero. I would mention that if it is not enough that someone came up with the idea and sketched it out, this is indeed a three-dimensional bobble-head-like statuette. Yes folks, somebody spent money having these made. Before I continue with my mockery, I want to mention that I am a huge fan of PowerShell. While I am not an expert, I think it is an excellent scripting environment that either does or will make the lives of IT Professionals the world over easier. In a day and age where servers are moving into the cloud (either private or public) it is a relief that we can now execute the same scripts against all of our servers… wherever they may be. It simplifies our lives in ways that many do not even understand – the back-end management tools, such as System Center and Microsoft Deployment Toolkit, along with dozens of others, are based on PowerShell. Add-ons like PowerCLI allow us to extend the functionality of PowerShell beyond our Windows servers and manage vSphere and vCenter Server. I think PowerShell is incredible, and have written several articles about using it to manage Hyper-V, Active Directory, and more. I also have a great respect for the PowerShell community. While I may mock them (and they do make it easy, with such fodder as Dr. Scripto and songs like Highway to PowerShell), but they are a passionate group of interesting individuals, some of whom it would even be considered safe to be alone in a room with… although be careful, I am reasonably certain Ed Wilson tried to write a script to reorganize my living room once. There is no question that if you need to figure out how to do anything in PowerShell one of them has either already written about it, or will be more than willing to do so once you post your question on-line. If you are more interested in face-to-face interactions then they can be found at user group meetings all over the world. Now fellas, I am not saying that any of these gatherings are good places to meet women, but if you want to learn about scripting these are the place to be. (Ladies, to be fair: if you want my advice I would not go there trying to pick up the man of your dreams either…) Experts like Ed Wilson (a long time Microsoft employee), and his wife Teresa (a long-time wife of Ed) not only attend meetings, they (okay, mostly Ed) speak at them all the time. Teresa has even helped to create these groups, and does a wonderful job of connecting like-minded individuals. In fact she is so good at it that she was recently recognized with the prestigious Microsoft MVP Award (in the discipline of PowerShell). Congratulations Teresa! In fact, it is Teresa who several years ago gave me Dr. Scripto. While not a PowerShell MVP, she said I did a lot to help the community both in the Greater Toronto Area and around the world. I was so honoured that it held a place of honour on my desk for several years, until recently when I emptied my home office and moved into the condo. Dr. Scripto stayed behind temporarily, until such time as he was once again needed. Recently Teresa and I had the opportunity to get together at the Microsoft MVP Summit in Redmond, Washington. She told me that it was indeed a shame that a couple of very well known PowerShell MVPs told her that they had never received a Dr. Scripto Bobble-Head. She was disappointed that there was nothing that she could do for them, but alas, they were a limited edition one-time deal, and even if there was budget to make a new batch (there isn’t) it would diminish the cachet of the existing ones to make more. She told me the name of the MVP who did not have one, and I immediately recognized it. It is a shame that he did not have one of these prized (??) collectibles. …Okay, the part about the cheque was made up… and I embellished a bit, but the long and the short of it was that when I returned to Canada I was going to look (carefully) through the boxes that my office was packed into to find Dr. Scripto, and if I was able to find it I would give it to the MVP in question. As you can see from the picture, Dr. Scripto has been located. He is alive and well, with nary a scratch on him. He has spent several years – good years – sitting on my desk, but alas, he is needed elsewhere. When I prepare for my next trip to the USA I will wrap him carefully so that he will not be damaged in transit to his new home… wherever that may be. If you do not have your own limited edition Dr. Scripto Bobble-Head, don’t worry… you can still learn to script like a champ using the knowledge he brought forth. He has his own page on Technet.Microsoft.com (Doctor Scripto’s Script Shop), his own Twitter account, and a number of YouTube videos (which were obviously not made by anyone with a firm grasp on reality or sanity). Don’t worry, he will be with you in spirit… and hopefully in good sanity!